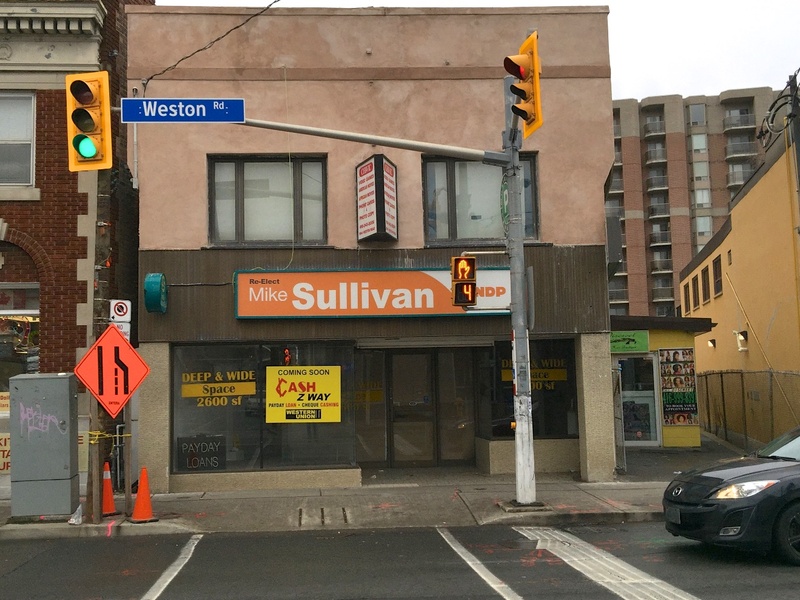 Former MP Mike Sullivan was no sooner out of his campaign office when Cash Z way set up shop at 1942 Weston Road. Payday loan companies (PLCs) paint themselves as businesses that help out people in times of need. They also claim to help people with middle class incomes. Since the province legalized their brutal rates of $21 per loan of $100, PLCs have proliferated. Incredibly that loan rate in real terms is 120,000% annually. PLCs claim that the loan is only for a short period of less than a month and so actual interest paid is low. However, there is evidence that many people get deeply in debt by paying one loan off with another from a rival PLC. Back in 2012, PLC front man (former Liberal MP) Stan Keyes claimed to WestonWeb that payday loan customers have a median income of $45,000. Councillor Frances Nunziata is not a fan of Payday loan companies. Weston is littered with them and no doubt without victims customers they would go out of business. In the past she has tried to limit their proliferation with measures that would essentially harass them through inspections. Council at the time was unsupportive. It’s hard to go after a business that is operating legally. MPP Laura Albanese is working on the problem from another angle but barring the province lowering the boom on companies charging such huge rates, (where are you Kathleen?) this City initiative seems to be the best alternative. The tactic tried successfully in other cities has been to limit the number of PLC stores in an area. Nunziata’s motion co-sponsored with Councillor Kristyn Wong-Tam and put before Council this month will aim to limit PLCs by legislating a minimum distance between them. These companies are predatory and the victims ill-informed about cost and alternatives, like our own local Victory Credit Union and bank procedures. Anything that can reduce their presence is welcome. Next Next post: Horwath hosting Hydro Happening Tomorrow.